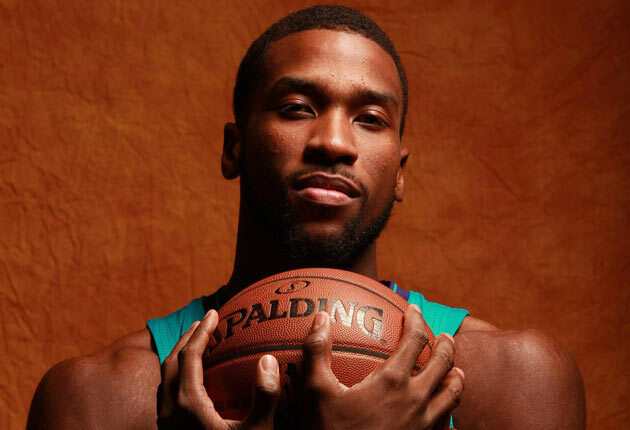 Michael Kidd-Gilchrist is still finding his voice -- and his jumper -- as he develops in the NBA. This article appears in the Feb. 2 edition of SI. To subscribe, click here. In a sense he was correct. There is nothing inherently exceptional about an NBA player sinking a long first-quarter jump shot and nothing at all unusual about that player giving a postgame interview. Dozens of similar scenes unfold across the league every night. But the effort that Kidd-Gilchrist poured into hoisting the shot, and doing the interview, was far more significant than he let on. AAU programs recruited Kidd-Gilchrist when he was seven. Jay Z befriended him when he was 12. His middle school team was sponsored by Reebok. His high school team was the subject of a documentary on HBO. He was considered by many the best prep prospect in the country -- when he was still a junior. He played in high school with Kyrie Irving, the No. 1 draft pick in 2011, and in college with Anthony Davis, the No. 1 selection in ’12, and Kidd-Gilchrist was more acclaimed than either. Charlotte chose him with the second pick in ’12 after he won a national championship in his lone season at Kentucky. Getting buckets and addressing reporters was as much a part of his routine as his morning Bible study. But if the events of opening night were so customary, why did his mother break down in that arena restroom? Why did one of the most accurate shooters in basketball history embrace her on the court following the game? And why did an acclaimed speech pathologist in Lexington, Ky., call up the Hornets’ website and listen to the postgame sound bites? “MKG is just about everything you’d want in a player,” Jefferson says of the 6' 7" slasher who can cut and finish, run the floor and defend the perimeter, create shots and contest them. Kidd-Gilchrist remains the rare prodigy who scraps like a 12th man. But the modern NBA requires that its wings fire jumpers and its stars command microphones, and those happen to be the two areas in which he is not preposterously talented. Those happen to be the two subjects of his life’s work. Kidd-Gilchrist is rummaging through his backpack on the 14th floor of the JW Marriott in downtown Los Angeles, searching for a DVD of The Lion King, which he carries almost everywhere he goes. His earliest memories are of watching the movie with his father, Michael Gilchrist Sr. He was Simba. His dad was Mufasa. They bought the stuffed animals. They recited the lines. In August 1996, a month before the boy’s third birthday, Michael Sr. was shot and killed in a still-unsolved murder on the east side of Camden, N.J. Michael says he remembers the last time they were together. “We were in bed,” he says, “watching The Lion King.” At the funeral, he slid the Simba doll into the casket. Cindy, who had suffered through four failed pregnancies and delivered Michael seven weeks early, built a cocoon around her son. They lived in Somerdale, N.J., and spent afternoons at the Camden County Library, reading books and sipping cocoa. They went on “date nights” every Thursday, eating at fancy restaurants and discussing the difference between dessert forks and regular forks. Cindy found several father figures for Michael: her second husband, Vincent Richardson; her brother, Darrin Kidd; and her childhood friend William Wesley, whom she knew long before he became the ubiquitous CAA agent nicknamed Worldwide Wes. Gripper coached Michael’s middle school AAU team, the RBK All‑Stars, and he pegs their record at 100–1. “The loss,” Gripper laments, “was on a half-court heave at the buzzer.” When Michael reached eighth grade, he stood 6' 6", a center racking up quadruple doubles. He so relished contact in the key that he wondered if he should take up football instead. His jumper was –unorthodox -- he kept his guide hand on top of the ball -- but only a nitpicker would have complained. He controlled every inch of the floor. Who cared whether he spaced it too? Kidd-Gilchrist watched old clips of himself on his phone, draining jumpers at Kentucky, set to Eminem’s “Not Afraid.” He was no marksman then, either, but he was a near 75% free throw shooter, and you couldn’t leave him alone at 10 feet. “I don’t know what happened or why it happened,” he says, calling up the footage on his phone. “Everything got in my head. I was like, ‘Damn, I can’t shoot anymore.’” Kidd‑Gilchrist is the kind of guy who will go shopping for jeans and immediately see a pair he likes, but then go to five other stores to see if they have a pair he likes better. The shots were like the jeans: None of them were good enough. “I turned them all down,” he says. “I lost my confidence.” He attempted just 5.7 field goals per game last season, and most of those were within three feet. A reporter once asked Mark Price what he thought about when he missed five shots in a row. “That I’ll make the next five,” Price replied. Over a 12-year NBA career, spent mostly in Cleveland, Price hit 90.4% of his free throws and 40.2% of his three-pointers. In 1998 he retired and moved home to the Atlanta suburbs, where some friends were starting a training facility with seven basketball courts called Suwanee Sports Academy. Price built a shooting lab in the complex, outfitted with cameras that measured arc and angle. At least 25 pros, including then Celtics point guard Rajon Rondo, took summer trips to the lab. Price was Hakeem Olajuwon for the smaller set. Several teams hired Price as a shooting consultant or player development coach, but in 2013 the Hornets made him a full-time assistant. His first project was Kidd‑Gilchrist. “Good luck,” another coach told him. “You can’t fix that.” Price accepted the job on one condition: “Nobody tells Michael Kidd‑Gilchrist anything about his shot but me.” Price suggested subtle alterations throughout last season, but the stroke required massive reconstruction, and that demanded months of dedicated training. They spent the summer together -- at the practice facility in Charlotte, the lab in Suwanee, summer league in Las Vegas. They started with the feet, pointing them at the basket, in order to square the body. At first, Kidd‑Gilchrist wasn’t allowed to shoot. He just jumped in place. Then he was allowed to shoot, but without his left hand, which forced him to straighten his right wrist and right elbow. An entire month was devoted to form shooting from 10 feet and in. Slowly they inched back. The release rose. The hitches vanished. Sometimes they only worked 30 minutes a day, and sometimes three hours. “I wanted him to leave the gym with confidence,” Price says. Kidd-Gilchrist was banned from playing pickup, or shooting on his own, for fear that old habits would resurface. Price kept him close. He invited him over for family dinners. Price’s youngest son, Josh, did the rebounding. Only 21, he has overhauled a fundamental part of himself. And it’s not the first time. In June 2011, Kidd-Gilchrist met Meg Shake at Kentucky’s Center of Academic and Tutorial Services, known on campus as CATS. He talked about his father, whose murder site on North Dudley Street he still visits to feel his dad’s presence. He talked about his Uncle Darrin, who died of a heart attack the day Kidd-Gilchrist signed at Kentucky, inspiring him to add Kidd to his last name. But mostly he talked about his stutter. If Price was his shot doctor, Shake was his speech guru. She met with him twice a week and demystified the phenomenon that is human speech: how the mouth and tongue and lips form different sounds, how vocal cords vibrate, and how we all stammer occasionally at the onset of pressure. Kidd-Gilchrist relearned, in a sense, how to speak. “Make a p,” Shake says. “Where does your tongue go? What do you do with the air? Does it pop out of your mouth or glide out?” For letters that pop, like p and b, he tried to lighten the contact between his lips. For ones that glide, like all the vowels, he tried to stretch the sounds and therefore ease the tension in his mouth: “I looove the fans,” for example. He honed a technique called continuous phonation, in which he linked words together as if they had no spaces, allowing the vocal cords to continue vibrating. Shake discovered that Kidd-Gilchrist responded to movement, so he sometimes spoke while sliding a finger across his leg, and to rhythm, so she brought a metronome to their sessions. For Christmas, Kidd-Gilchrist’s grandmother gave him a metronome watch, the kind worn by drummers. 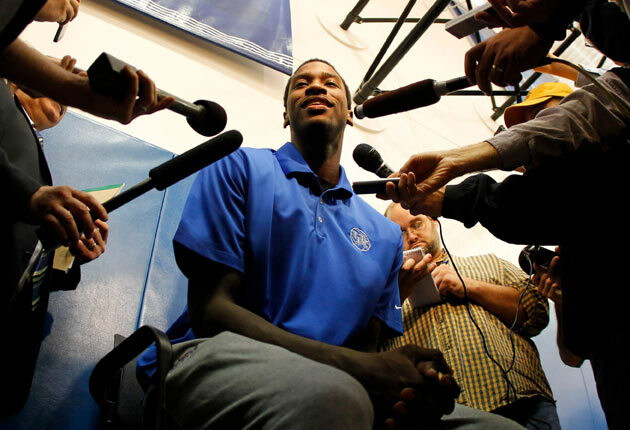 Like many people who stutter, Kidd-Gilchrist is mostly fluent when he sings, speaks in accents or reads aloud. He and Shake read in unison. She provided tools and confidence, same as Price. They graduated from sounds to words to sentences. Shake would give Kidd-Gilchrist an a, which would become apple, which would become a short sentence about an apple, which would become a longer sentence about an apple. They mimicked interviews on Kentucky’s practice court, starting with simple questions (“What’s your birthday? What’s your favorite food? What’s your favorite movie?”) and progressing to involved ones (“Why did you change your name? Where does your motor come from? What is it like being so far from home?”). Shake used a microphone from her children’s Wii. She then assigned Kidd-Gilchrist more questions to answer in his spare time. He talked to himself a lot. Shake was not a big basketball fan, and privacy laws prohibited her from discussing her high-profile patient without his permission, so her kids didn’t understand why Mom kept sneaking into the bathroom after games, listening to interviews on the radio. She and Kidd-Gilchrist broke down the tapes later. “Listen to how beautiful your statement was!” Shake would exclaim, while he protested. They could typically hear a water bottle, which he clutched to occupy his hands, crunching in the background. Over three million Americans stutter and nobody knows exactly why. Genetics are a factor, according to Shake, and so are life events. “Everyone’s story is different,” she says. “But a lot of people who fit this profile do have certain personality characteristics that are similar. They’re often perfectionists. They’re pleasers. They might be worriers. They tend to carry a lot on their shoulders.” These are some of the qualities that made Kidd-Gilchrist the second pick in the draft. They’re also some of the qualities that made his jump shot go haywire. Price believes there is a connection between the stroke and the speech. Shake isn’t sure. Speaking and shooting are both finely coordinated movements, and a person who falls out of coordination in one area could theoretically do the same in another. But speaking comes naturally, while shooting is learned, and a shot is supposed to stay consistent while speech is constantly in flux. “They remind me a lot of each other,” Kidd-Gilchrist says. “I was laughed at for my speech, and I was laughed at for my shot, and I went through a big process for both of them.” In each case there is no simple cure. Just as his right elbow still sometimes drifts inward, he often pauses between phrases, as if warming up the vocal cords. He fiddles with his phone, regains his rhythm and continues. He enjoys talking about speech, though not necessarily his own, and he leans forward when he hears about kids who stutter. He helped inspire a 13-year-old boy from his Jersey neighborhood, Saadiq Wicks, to establish a small nonprofit called L‑L‑Let Me Finish. The organization raises awareness and money to send children with speech impediments to Camp SAY in Hendersonville, N.C. Kidd-Gilchrist is on the board.